Here in America it seems like food trends come and go every twenty minutes or so. Is meat in or out? Do we like bread or bacon? Acai berries, or lemon juice and cayenne pepper cleanses? It seems futile to keep up with the Joneses sometimes. One craze that has remained on the scene for several years now, however, is pomegranate juice. Native to Southwest Asia, pomegranate trees are now cultivated all around the world, and with antioxidant levels compared to those of tea or red wine, the fruit’s juice is heralded by many as the key to lowering cholesterol and preventing several types cancer. It also shows up in grenadine, a cocktail accoutrement used to give pomegranate flavor and a reddish tint to mixed drinks. According to the OED, in ancient times pomegranates were considered symbols of resurrection, fertility, plenty, unity, and chastity. In ancient Greek culture, the fruit was associated with the goddess Persephone who Hades tricked into eating four pomegranate seeds while she was in the underworld, thus condemning her to spend four months of every year with him. The four months constitute winter, for nothing can grow without Persephone’s presence on earth. Jewish tradition likewise links the fruit to fertility or fruitfulness. It is one of the images on the ancient coins of Judea as a holy symbol and some Jewish scholars believe that pomegranates may have been the forbidden fruit that Adam and Even ate in the Garden of Eden. The fruit’s relation to fertility is apparent to anyone who has cracked open a pomegranate—hundreds of tiny, jewel-red seeds shimmer in a creamy white flesh. The pomegranate is certainly a plant determined to reproduce. What is less apparent is the fruit’s relation to modern warfare. Stemming from the 12th century Anglo-Norman pome gernate, our English pomegranate became pume grenate in Old French. This pume grenate eventually became pomme grenade in Modern French. Pomme grenade, of course, looks exactly like grenade or hand grenade, and this is no coincidence. The word grenade actually stems from the French pomme grenade. Now thrown by hand, grenades were originally designed in the 8th century. Soldiers discovered that Greek Fire, which was usually thrown by flamethrowers, could also be contained in glass jars, thus heightening it’s effect by explosion. By the 15th century, cast iron grenades filled with gunpowder entered the scene and the weapon hasn’t changed much since then. Today’s hand grenades are definitely lighter and smaller, but the general design isn’t too different than that of the Byzantine Empire’s. So why name the weapon after the fruit? If you were to crack open a hand grenade today you would see tiny balls of shrapnel inside the explosive’s casing. 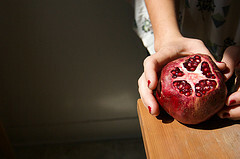 The shrapnel mimics the pomegranate’s seeds—each seed the potential for a new tree, each shrapnel the potential for a hit body. Shaped like a pomegranate and designed like a pomegranate, it’s certainly ironic that a weapon used to kill several people at once is named after the ancient fruit of fertility.